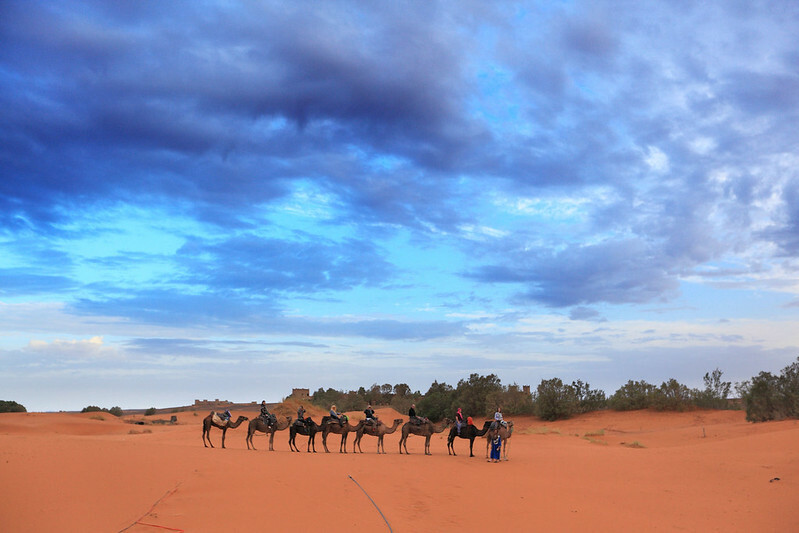 M. and I got on the lead camels of the two separate trains, so we were separated for most of the ride this time. 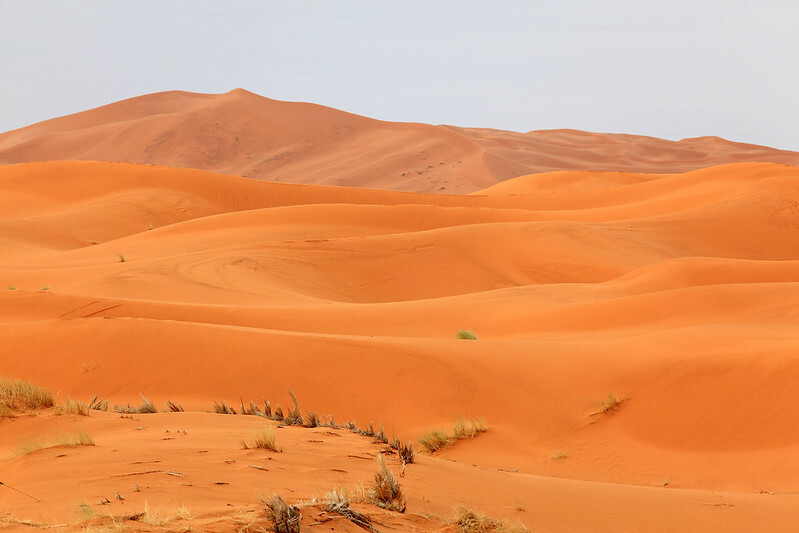 When we got on the bus, M. said that while were we out in the dunes a mobile phone ring tone had gone off and the Berber camel driver had reached into a pocket and answered it! Out of the dunes we came back past a flat area where water had collected from the overnight rain. It reflected the cloud patterns in the sky. Sitting on the camel has strained my thigh muscles, which are sore now, the soreness beginning as soon as I got off the camel last night on the way into the desert. Back at the auberge we split up into groups having breakfast and using the seven available showers. M. and I were in the first shower group and quickly rinsed off the dust of yesterday before dressing and heading for breakfast. This was a simple affair, with Moroccan bread, roti, semolina bread, jams, honey, boiled eggs, and drinks. One of the jams was fig and it was delicious. So I went back for more roti slathered with this jam. Breakfast done, some of us slipped out the back to the patio for a few parting photos of the dunes. The sun had broken through now and was imparting a beautiful glow to the colour of the sand. I lent Ben my long lens so he could take a few close ups of the dunes, and then we headed out to board the bus for the long drive. We just passed through the town of Jorf. We have just stopped at a place in the countryside past the small town of Fezna, where there are hundreds of raised crater-like wells, in rows along underground irrigation tunnels, called qanats. These have been built since the 14th century, and only abandoned in the 1900s. 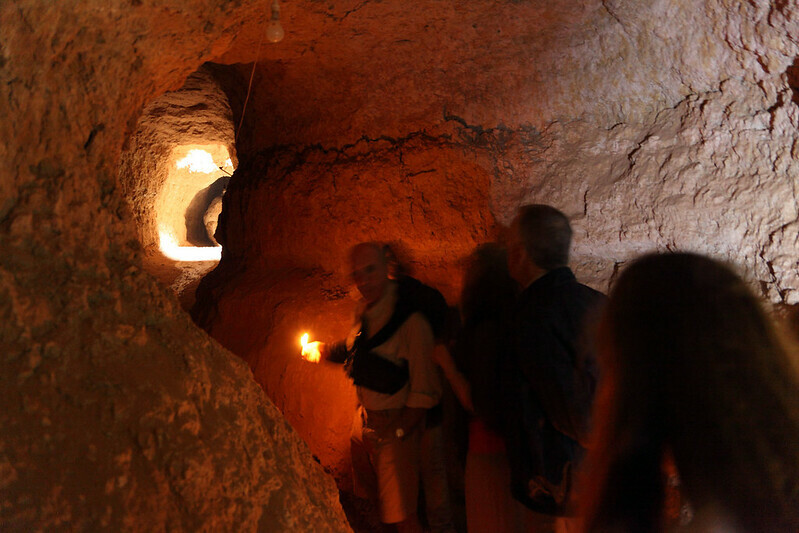 The tunnels are about 20 kilometres long, running from the mountains to the oasis towns on the plain. We took a short tour down into the tunnel, about two storeys down. The tunnel was dry and dusty, with a high ceiling and plenty of space to walk around. It was an interesting place to stop for a few minutes, and we paid the owner of the well 10 dirhams each for the tour of the tunnel. Inside a qanat tunnel, outside Fezna. We have just left a coffee and toilet stop at a cafe by the side of the road. They also had WiFi so I took the chance to post a quick photo and check my mail. M. had a nos-nos, but I didn’t bother with a drink. Lahcen has explained to us why so many of the houses in the towns and villages look half built or unfinished. They don’t pay property tax until the house is finished, or until six years have passed. So, magically, every single house takes a full six years to build. Though people will be living in the “partly completed” houses for most of that time. The rain has really been coming down in places as we drive through heavy showers. It collects in large shallow puddles in the desert and in the towns along the roads. They don’t seem to have a drainage system, probably because they don’t need one 99% of the time. Rainy weather in Todra Gorge. We have stopped at a police roadblock before a weir where the water is flowing over the road. It looks like they are not letting people across the floodwater. This is the same weir we drove across to get into the Todra Gorge, but now it looks like the water is higher. 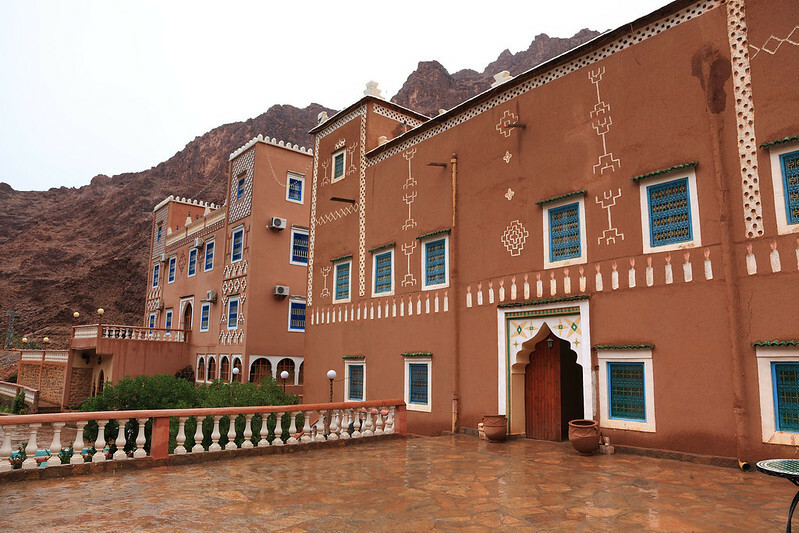 We stopped for lunch in the Todra Gorge, at the Maison D’Hote Kasbah Taborihte. 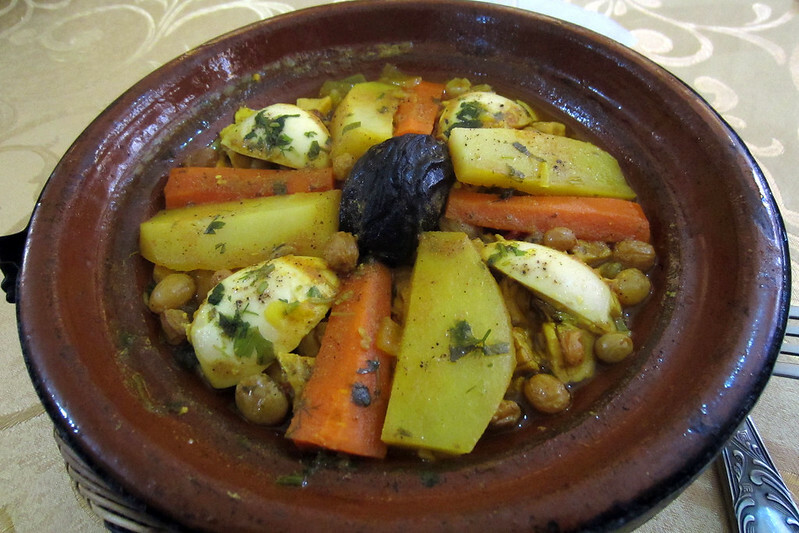 The specialty in this region is kiria, which is a dish made of chopped meat, either chicken or beef, cooked in a tajine with potato, carrot, raisins, and boiled eggs. I tried the chicken. The spice mixture was subtly different to all of the other tajines I’ve had so far, with more of a chili/pepper flavour, and very delicious. It came with the usual bread and olives. M. had a Berber omelette again, but this one was very different to the last one, with more of a peppery onion sauce with less tomato, and the eggs stirred through it rather than cracked on top. I tasted it and the flavour was very similar to my kiria. Chicken kiria at Maison D’Hote Kasbah Taborihte. The restaurant was in a spectacular setting in the gorge, surrounded by red rock walls towering above and with palm trees in the valley between them. We had to walk down a set of steps in the rain, then cross the river on a wooden bridge, then climb up the other side to get to the hotel. The river under the bridge was a roaring torrent of brown water, powered by the rain which is still falling outside. It was fairly heavy and we got quite wet walking the hundred metres or so to the hotel restaurant. While driving to the restaurant, we passed a van coming the other way, which exchanged some dialogue with our driver, Mohammed. Apparently the road further up the gorge is cut by floodwater, so our drive up the higher, more scenic reaches of the gorge has been cancelled. Instead, we drove as far as the roadblock, and then walked about fifty metres to where the raging river flowed under a flat concrete bridge as it spilled out of a spectacular canyon of sheer rock. It was wonderful, but the rain was enough to cut short our visit to a quick few photos and then a scramble back to the bus. After some thoughtful consideration and watching a few other cars brave the floodwater over the weir, Mohammed has successfully forded the river with our bus and we are on the way to our next stop for this evening. We have stopped at another flooded river crossing. This one looks faster and deeper than the previous one, and no cars look like trying it at this point. There are a few dozen vehicles lined up on either side of the water, with people just looking and wondering what to do. Lahcen is on the phone, presumably to the tour company to discuss a backup plan. Anna is talking to a local kid out the window, refusing to buy woven palm fronds from him, but asking for bottles of wine. Greg just joked that they are life rafts. People are getting giggly and wondering what we’re going to do and where we’ll get wine from. Flooded river crossing in Todra Gorge. More seriously, the rain is getting heavier if anything, and there is no way the river is going down for several hours at least. Some sort of uniformed authorities have arrived. Lahcen says they are a sort of emergency response crew, not police. I’m not sure what they’re doing. A big yellow front-end loader has arrived and attempted to cross the river, but a short way into the raging water it dipped and heaved alarmingly, as if there is either a tree or something hidden under the water on the road, or part of the road has been washed away, leaving a huge hole in the road. It’s impossible to tell for sure with the racing brown water churning and roiling like it is. But the road is certainly not passable as it is. One interesting factor is that the loader had a small cab on top, but they seem to have crammed in about seven or eight people in there. It resembles a telephone booth stuffing attempt, with people plastered against the glass of the cab on all sides. It’s really quite amazing. Lahcen has organised a plan. 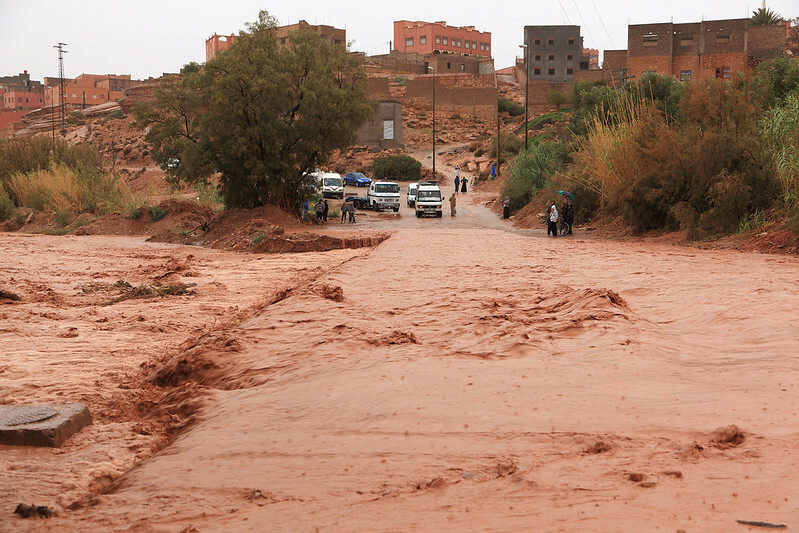 We can’t get across this river, so we are going to go back to Kasbah Taborihte, where we had lunch. They have rooms there and can hopefully put us up for the night. We are stuck. We have reached the first flooded weir that we successfully crossed earlier, but the water has now risen alarmingly and it looks like certain suicide to attempt to drive across it. So we are between the two flooded river crossings and have nowhere to go. There is just the one road running along the gorge, so there is no other way out. Lahcen has raced into a nearby hotel, probably to see if he can beg rooms for us for the night. 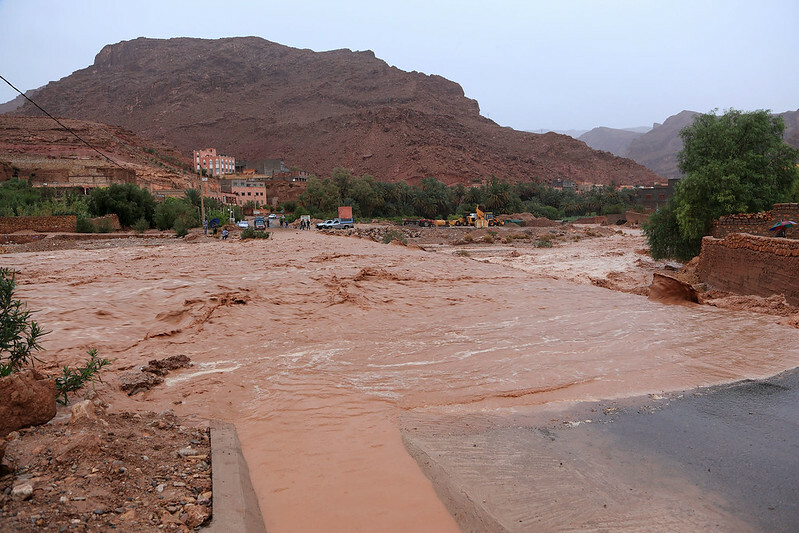 The second flooded river crossing in Todra Gorge. This is the one we had driven across earlier, but now it was much deeper. I went out to take a video of the floodwater over the road, and stood at the edge of the water. As I stood there panning the camera to take it all in, the water surged up the road and I had to take two full steps back to avoid it getting up over my shoes! I really don’t see how this water level can go down as long as it keeps raining. We have just checked into the Kasbah Taborihte, the place where we had lunch. Lahcen phoned ahead and arranged for porters to come over a footbridge over the river from there to pick up our luggage and carry it about 500 metres back to the footbridge and across to a waiting van on the hotel side of the river. We had to walk through the pouring rain the same distance over the bridge to the van, from where they drove us to the hotel. They have enough beds for us, but several of the others are sharing rooms for three or four people. We are lucky again, being the married couple, and having a room to ourselves. The walk involved tramping up some very muddy tracks between mud brick houses. At one point we had to turn back because the track was cut by a torrent of rainwater which we couldn’t cross. Getting around this involved heading uphill a couple of blocks and walking along a road, and then down a steep and slippery, muddy embankment, with ongoing rain falling. Lahcen helped people down and fortunately nobody slipped or fell. We reached the bridge and crossed it into a series of paddy-like fields, with irrigation ditches between them, which were running rapidly with water from the rain. We had to walk between the fields on grassy ridges and this part of the walk was okay, and would have been scenic and interesting if not for the heavy rain and the fact that most of us had no protection from it. The hotel Lahcen had looked into back on the other side of the river turned out to have not enough rooms, so he sought another option, calling Taborihte to see if they could do anything (possibly via his head office). We have checked into a nice enough looking room here, but there is no hot water. Lahcen said he’d get them to switch it on or something, but no luck yet. Well, it’s been an eventful day! We are safe and sound in the Maison Kasbah Taborihte, but the rain is still pounding down outside. The hot water eventually came on at 20:30 and M. had her shower then, and skipped dinner to hop straight into bed. I had my shower earlier using just cold water, and went down for dinner at 20:30 with the rest of the group. Lahcen had found a bottle of red wine from Meknes somewhere, and shared it with the group while we quizzed him on whether he’d had worse problems on a tour, and what our options were for tomorrow. He said that at the moment, assuming we get out of here tomorrow, all we will miss is the four hour walk in the M’goun Gorge, which we probably wouldn’t have been able to do anyway with this weather, as it would be too treacherous. For dinner I tried the beef kiria, which was good like the chicken one I had for lunch. I stole half an orange slice off Jay’s salad as a mini dessert and then headed back to the room to finish typing up the day’s events and then get some sleep. This entry was posted on Monday, 15 December, 2014 at 20:04	and is filed under Diary, Travel. You can follow any responses to this entry through the RSS 2.0 feed. You can skip to the end and leave a response. Pinging is currently not allowed.